The semester is nearing its end, meaning PROM NIGHT!!! After class on Friday Annie, Rigzin and I went to town because she had a container from room food that she had to return to her home. (Room food definition: Room food is always better than mess food.) So we walked to her home in Motithang. Of course we were immediately served tea and Oreos; milk’s favorite cookie just became the world’s number one biscuit. Rigzin showed us the kiras her aunt had woven and the royal objects in her house, like the queen’s crown. Turns out Baby Rigzin is royalty. And a celebrity. She also showed us a picture of her uncle with Drew Barrymore. We also got to play with her little nephew. Language isn’t a barrier when you’re pulling your eyelids back and spraying people with water. On our way back down to town we visited the paper factory. Paper is made from the bark of the Daphne tree. The whole tree has to be cut down and the rest of the wood is generally used for burning. The bark is soaked in water to make it soft and then boiled using the wood as fuel. Then it is shredded and turned into a pulp. Then a screen is lowered into the pulp. When it’s brought back out the layer of pulp is put in a pile and pressed with a metal clamp to expel the excess water. The sheets are then hung individually on a heated metal surface to dry. The paper store is amazing. There are papers dyed with natural dyes, papers with plant leaves and flowers in them, papers splashed with water droplets making holes, paper lamps, notebooks, paper with paintings, paper on paper. When we were finally ready to move on we went down to town. Rigzin’s class was having their class dinner that night and we were invited to join. Since we missed our own class dinner we were super excited to go to this one. Lots of fooding, drinking and karaoke. Even Sir was into it. Annie and I even got a Taylor Swift song dedicated to us. Oh the perks of being American! After the dinner we all relocated to Mojo Park. This was where I met my prom date, Pema Tshering! 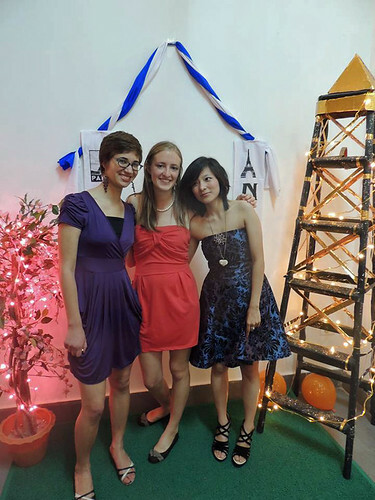 Then Saturday evening rolled around and it was time for prom preparations in Dorji’s room, where we always gather. The girls were doing each other’s hair and makeup. They all knew exactly what they wanted as we have had multiple fashion shows in preparation for this night. Meanwhile I just stood there in my basketball shorts eating Maggi and drinking Sprite. I finally put on Dorji’s dress, Rigzin’s earrings, Lolo’s shoes and let some girl I didn’t know put makeup on me. Once you arrived at the executive center, you were given a candy. There was music and lowered lights in a room but at this point people were feeling too shy for dancing. We found our friend Lhamo and went to another room of the building where they were serving rice, ezzay, pakora and tea. We went outside on a porch to eat it and I found nyigi Pema Tshering as I call him. Then we danced to all our favorites- Hookah Bar, Hello Hunny Bunny. I can’t explain the pure excitement of having all my friends and classmates around me to the songs that best remind me of the amazing experiences I’ve had in the country. No prom is complete without after prom. A bunch of charos piled into Pema’s and other’s cars and we drove up to Buddha Point. This was the place to go; there were tons of people just hanging out and having fun, cars were playing music, plenty of ara was passed around. It was like Dazed and Confused, jaggy styleee. Honestly, one of the most fun weekends, way more fun than my first prom. The Bhutanese know how to do it.